You’ve been able to rent HD movies on Apple TV for quite some time, and you can still rent several movies (like the typographical documentary Helvetica) in HD on the Apple TV but not in iTunes itself, so Apple still has work to do in getting everything caught up and synchronized. But in a lot of ways, this demonstrates the primary reason that the Apple TV ( ) is still an unfriendly little box. That’s aside from it being underpowered, a defect that makes the Apple TV very slow to respond when it’s syncing with iTunes, or downloading content, or when the number of seconds since 1970.01.01 is a prime number. Try looking at the source list in iTunes, on the left-hand side of the window. You see your library (divided by categories), the iTunes Store, any synchronized devices (iPods, iPhones, and Apple TV units), and then your own playlists. The iTunes Store is just one entry in a source list that is emphatically and wisely oriented around your music, videos, and podcasts. The full selection of the iTunes Store is right there, if you want it, but the store never interferes with managing, playing, and enjoying the media you already have—a solid design, since you probably like the videos and songs you already own, or else you wouldn’t own them. 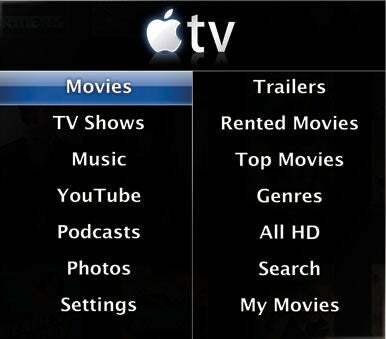 Now look at the image of the Apple TV menu below. On the left side, you see menu choices for Movies, TV Shows, Music, YouTube, Podcasts, Photos, and for Apple TV settings. Each of those exposes more choices on the right side of the display. For Movies, the secondary options Trailers, Rented Movies, Top Movies, Genres, All HD, Search, and My Movies. The TV Shows and Music menu options follow a similar pattern, with My TV Shows and My Music stashed at the very end of their respective menus. Do you detect the pattern here? Unlike in iTunes, your media is relegated to the very last option of each menu category. Out of six “Movies” choices, five are about obtaining movies from the iTunes Store, and only one is about watching the movies you already own in iTunes. Out of seven choices for TV shows, six are about obtaining TV shows from the iTunes Store. It’s even that way for Podcasts, where the choices are Favorites, Top Podcasts, Genres, Providers, Search, and My Podcasts. The Apple TV even expects you to find free podcasts by browsing the iTunes Store while watching TV, rather than letting you quickly and simply navigate to podcasts to which you already subscribe. The only exceptions are Photos and YouTube, and probably only because the iTunes Store doesn’t sell photos or provide access to YouTube. iTunes is about your music and video, with the easy option of obtaining more. Apple TV is about Apple shoving new, mostly-paid content down the Internet onto your television. The Apple TV should be iTunes for the television; instead, it’s the iTunes Store for your television. It’s a Web store, a marketing device, a sales pitch masquerading as a “digital entertainment hub.” Until it rightfully revolves more around your content than the iTunes Store, Apple can drop the price from $299 to $229 or lower and it’s still not worth it. Who would have bought an iPod if 90 percent of the first-level and second-level menu choices were about buying music rather than playing it? The Apple TV is the complete opposite of what it should be. Therefore, when Apple describes only one specific change in iTunes 8.1.1, and it happens to be “adds support for renting HD movies,” it very much sits the wrong way—it feels like Apple is starting to push iTunes in the direction of the Apple TV, rather than righting the Apple TV’s direction to mimic iTunes. While we realize the iTunes Store is extremely important to Apple, iTunes is not merely the front for the iTunes Store. One of the issues “addressed” in version 8.1.1, according to iTunes scripter extraordinaire Doug Adams, is a bug introduced in iTunes 8.1 that made the program run a script twice if you had assigned a keyboard shortcut to it. What else is in there? Apple knows, but thinks all you care about is renting HD movies. The company is going to keep doing this until the customers make them stop, so do your part: tell Apple that this “hide the changes, push the iTunes Store” information policy makes you far less happy with iTunes, and less likely to recommend it to others. Be specific and direct, but don’t be insulting. We’re dead serious about this: take a minute to do this today, and each time it happens, lest iTunes turn into Apple TV for your Mac. Adapted with permission from the 2009.04.07 issue of MDJ, published by MacJournals.com. Copyright 2006, GCSF Incorporated. For a free trial to MDJ, visit the MacJournals Web site. This story, "What's wrong with Apple TV" was originally published by MacJournals.com.